On the first Saturday of February, there’s an explosion of colour and sound in South Mumbai. Over nine days, the streets of Kala Ghoda erupt in music and dance, street plays, book readings and art workshops, larger-than-life installations and stalls serving up food and handicrafts from across India. A cultural festival as mammoth as this is a mindboggling feat to pull off and needs to be impeccably curated. Seventeen years old this February, the Kala Ghoda Arts Festival has become an integral part of Mumbai’s identity, as much as it is now a part of the identity of 56 year-old Brinda Miller, the woman at the helm of the event. But Miller is a lot more than the director of the Kala Ghoda Arts Festival. She is a widely recognised abstract artist and well-known for her contribution to beautifying public spaces in Mumbai. Her deep fondness for the city perhaps stems from her lineage; her father is Nana Chudasama, a former mayor and sheriff of Mumbai. 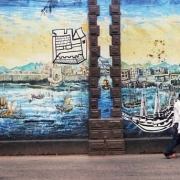 Along with her husband, architect Alfaz Miller, and other collaborators, Miller has worked on several public and institutional walls around the city—the mosaic wall of the Colaba Police Chowky at Fashion Street, a mural at the Prince Aly Khan Hospital in Mazgaon, the enormous mural at Lion Gate at the Naval Dockyard and giant public installations. On stretched canvas, Miller renounces all order and symmetry as she applies multiple layers of paint, embellished by textures and patterns. She demonstrates great control over textile and printing techniques that she uses to cut through those layers of paint. She uses lots of paper—corrugated sheets being her favourite—that are painted on and pasted. Dried paint is often detached from the bottle and given a place on her canvas. And she uses bubble wrap, packaging material and stencils—what may be a plastic tray with holes for you could easily be an improvised stencil for Miller. With not a single artist in the family, her parents assumed their daughter would eventually change her mind, as children often do when they grow up. But when the time came to pick a college, she said she wanted to go straight to art school. At the JJ School of Art, Miller studied textile design. With a booming textile industry in Mumbai, textile design was the ‘engineering and medicine of art’. “But I enjoyed it,” she says with a smile. She was having the time of her life. A year into her course (and a year to go), she returned to Mumbai to collect some transcripts from her old alma mater. Little did she know that she would never return to Parsons, for life had other plans for her. While waiting for the dean to sign her papers, she decided to put on an exhibition. A charming young architect named Alfaz Miller, who was on the lookout for a painting for a client, walked into the exhibition. But all the paintings he liked had already been sold. As she was going to be in the city a little while longer, she offered to make one on commission. “While I was doing the painting, we’d meet every now and then and talk. Then, one day, he proposed to me. I said, ‘No!’ I wanted to go back and study. So he said, ‘Go back, finish, do whatever you want to do.’” It was an offer she could not refuse. There may just be time yet. After over a decade as the honorary director of the Kala Ghoda Arts Festival, Miller says she is finally ready to hand over the reins if the right person comes along. At the age of 56, it’s time for Miller to go on to new adventures or perhaps take over where she left off on old ones. She has always dreamt of living in New York as an artist and with her two daughters (Aahana, 25, and Aashti, 22) all grown up and pursuing higher studies in architecture, she once again has the world at her feet. “I’m not looking for riches or fame but for fulfilment. There are many things that I’ve cut out that don’t contribute to my life. Housekeeping is one. I just hate it. Making Excel sheets is another,” she says with a laugh. Like her art, her life is a collage of events that in the end form an abstract, yet coherent, image.